JMS has been working closely with Senesco Marine in Quonset Point, RI to develop a pair of unique tank barge conversion designs. The goal is to convert two existing single skin tank barges into deck barges. The single skin tank barges have been phased-out due to the requirements of OPA 90. These two tank barges were state of the art in the 1970’s when they were constructed and entered service, and have been maintained and operated ever since. As a result, they represent significant steel structures to form the basis of new deck barges. 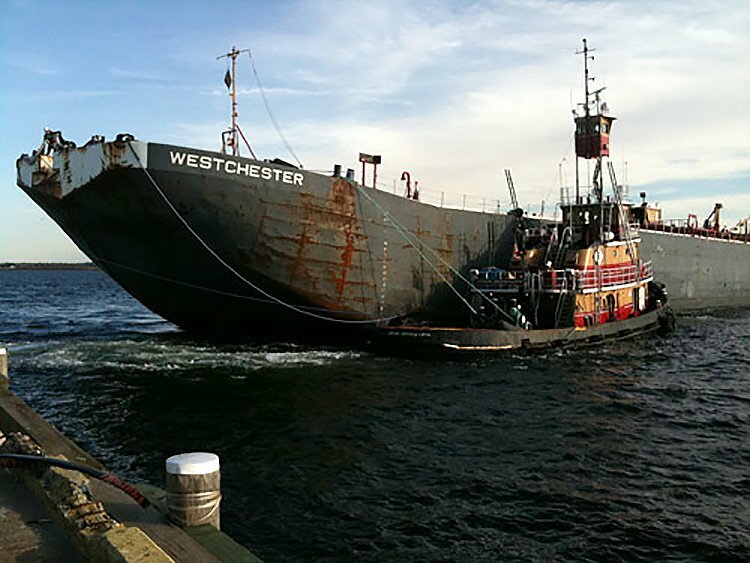 The two existing tank barges, the RTC WESTCHESTER and the RTC ROCKLAND are sister barges built by Avondale Shipyards and are 316′-6” long with a 60′ beam and 26′-5” depth. They are manned barges with accommodations aft, a notch for a tugboat’s bow during maneuvering operations in port, and 4 cargo compartments port and starboard. Both barges will be shortened to 215′-0”. The ROCKLAND will be cut down to a depth of 12′-0” and the WESTCHESTER to a depth of 15′-0”. New decks, transom collision bulkheads and headlogs will be installed on both. The tank barges will be end-for-ended, having their original spoon bows cut off and a new vertical transom fitted in its place. The lower portion of the tank barge stern rake will form the new forward or bow raked section of the deck barge with the addition of a headlog The deck barge ROCKLAND will have a deck rating of 2,500 PSF, deadweight capacity (DWT) of 2,100 LT and a Load Line draft of 8′-0”. The WESCTCHESTER will also have a deck rating of 2,500 PSF, but will have a deadweight capacity (DWT) of 2,700 LT and a load line draft of 10′-0”.